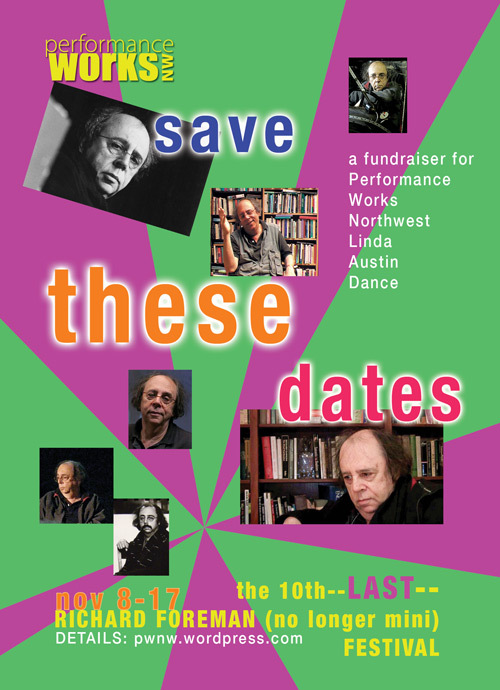 Performance Works NW is pulling together the 10th version of its annual fundraiser inspired by the work of avant-garde pioneer Richard Foreman. Formerly known as a “Mini-Festival,” it is “Mini-” no more. For this 10th and final Festival will stretch out over ten days of Foremanesque antics around the city in which a stellar array of Portland-area artists extract, rearrange, dismantle and mangle selections from the Foreman’s online royalty-free notebooks, culminating with a final performance at PWNW on Saturday November 17, 2012. On this day, as in previous years, audiences will be amused, befuddled, surprised and thrilled by the stagings of dance, theater, performance, video, music created by the brave artists who will receive the text and rules for staging just 10 days prior to the performance. On the 9 days leading up to this grand finale, Portlanders can graze from a smorgasbord of geographically-dispersed ancillary events such as installations, a treasure hunt, guerrilla performances, webcasts, cocktail parties, house performances, readings, tournaments etc. at various times of day. These will also comprise a recapitulation of all the Foreman Texts used thus far. See the list below. For updates, roster of artists, schedules and locations as they develop, keep checking in here! –Artists for the Nov. 17 event receive text and rules.